University of Ulster academics will have two more reasons to celebrate Burns’ Night this Friday. The project team behind the Ulster Poetry Project at the University’s School of English and History has made a major contribution to two BBC Northern Ireland television programmes that will be broadcast to mark the ever-popular anniversary of the Scots poet, Robert Burns’ birthday on 25 January. In the first programme, Dr Frank Ferguson acted as a consultant to Doubleband Films Productions for ‘An Ode to Burns And Ulster’, which will be broadcast on BBC Two at 9pm. In the programme, historian Neil Oliver talks to poets Seamus Heaney, Tom Paulin, Frank Ormsby, Chris Agee, Adam Gillis and Miriam Gamble and traditional singer, Len Graham. The second programme ‘Eddi Reader’s Rabbie Burns Trip’ sees Dr Ferguson and Dr Carol Baraniuk of the project team assist Scottish singer and songwriter Eddi Reader on her journey across the province in search of the story of the rhyming weavers. In the programme, also on BBC Two at 9.30pm, the Fairground Attraction front-woman takes to the road in a camper van to share her love of Robert Burns and to learn about Ulster’s ‘weaver poets’ and the language and themes they shared with him. Eddi Reader said: “I’d have loved to have met Robert Burns. I’d love to take him by the hand and take him to all these places that know him. I think he would have been amazed. “What Burns did for me, which is I think what he did for the poets, was reveal to them that it was okay to sing in your own voice. Dr Ferguson added: “I am very excited to have been part of these two excellent programmes that demonstrate how meaningful Burns is and was to Ulster poets. An Ode To Burns And Ulster, BBC Two Northern Ireland, Friday, January 25 at 9pm. 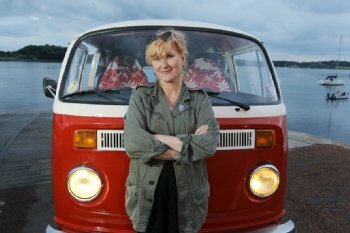 Eddi Reader’s Rabbie Burns Trip, BBC Two Northern Ireland, Friday, January 25 at 9.30pm.